WorldTimeZone.com (over 37,000 pages) continues to be a free online resource. or purchase from our online store would be most appreciated. 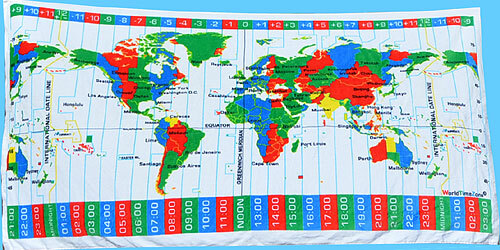 World Time News: Time Zones, rules, and Daylight Saving Time rules are ever-changing. WorldTimeZone.com constantly researches, validates, and implements these rule changes, providing you current information in a single location in the news section. Frequently Asked Questions: The FAQ page contains unique and interesting (sometimes confusing) facts about global time / time zones. We at WorldTimeZone.com have met people around the world who are already familiar with our Web site. Click on our global travel link and please sign our visitor book. WorldTimeZone.com subscribes to third-party advertisers. While we make every effort to monitor the advertising feeds, WorldTimeZone.com does not control the images, content, or quality of the advertising.